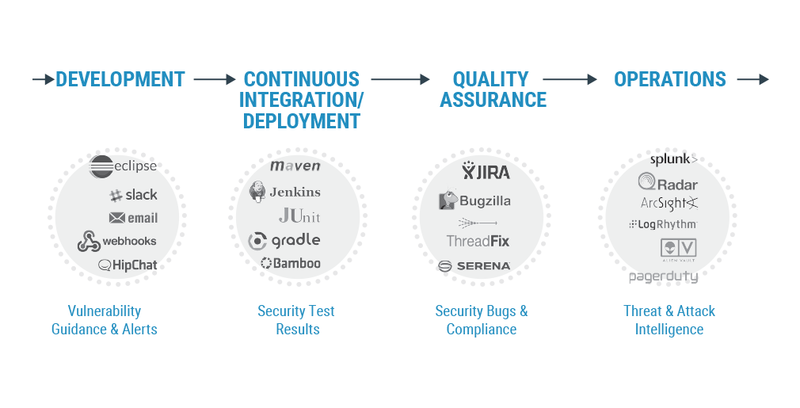 Contrast Application Security Lifecycle Stack (CASLS) is designed to help integrate security into a continuous DevOps application lifecycle. Application Security can not be just a "stop on the development train" or an agnostic piece of network equipment. It must be an integrated, "always on" approach across your organization. Whether you are looking to develop more secure applications right from the start of the process or protect the ones already in production, security needs to be addressed at every stage and integrated right from the beginning. With the CASLS program integrating security into all stages of the lifecycle is easily done by leveraging tools that the team already knows and uses. This speeds up the process and increases value on what is already owned, while eliminating the repetitive cycle of one time security scans and training of network equipment. "Self-Protecting software is a significant evolution in the approach to software security on AWS. With Contrast Security, AWS customers now have a means to get continuous visibility into application layer attacks and the ability to immediately protect themselves from new threats." Contrast’s premier alliances are the cornerstones of the CASLS Program. These partners provide innovative ways to bring security into any cloud application. Contrast is an Advanced Partner with Amazon Web Services Partner Network. With certifications on AWS offerings and products as well as a backend built on AWS, Contrast is able to provide support for any application that AWS offers. IBM is a premier Cloud Foundry partner and Contrast is the only web application vendor that supports major partners with specific agents like the one for IBM. The Contrast agent is available for inclusion in the IBM BlueMix build packs allowing for security in the cloud from the beginning of development. By integrating with Visual Studio Team Services (VSTS) or Team Foundation Server (TFS) vulnerability data, from Contrast, enables tickets to be automatically generated, team comments to be synchronized and pushes notifications for customers applications. Contrast also supports Microsoft .NET applications as they are developed, tested and run... even on the Microsoft Azure cloud service. Integration with Pivotal allows folks, who are moving to the cloud, to easily bring security along. The Contrast agent is available with native Cloud Foundry build packs which enables security to begin at the start of an application's lifecycle. The Contrast Security Service Broker for PCF allows both development and operations to gain real-time threat intelligence and enables apps to defend themselves from attacks. API’s or certified interoperability security can be integrated though partners tools. Read a short press release to see how easy Contrast makes it to share vulnerability data.